Day 1. Arrive Delhi. Transfer and overnight hotel. Day 2. Take morning Shatabadi to Chandigarh. Transfer & overnight hotel. Day 3. Ride to Shimla. Overnight hotel. Day 4. Ride to Narkanda. Overnight hotel. Day 5. Ride to Shoja by crossing Jelori Pass. Overnight camping. Day 6. Ride to Kasol. Overnight guest house. Day 7. Ride to Manali. Overnight hotel. Day 8. Rest day in Manali. Day 9. Ride to Rohtang Pass. Come back to Manali. Overnight hotel. Day 10. Ride to Prashar lake. Overnight guest house. Day 11. Ride to Dharamsala. Overnight hotel. Day 12. Next morning, you will be taken to Pathankot by a cab. Take afternoon train to Delhi. Overnight hotel. Day 13. Transfer airport for your departure. Extended tour: You can have a one night trip to Agra from Delhi. 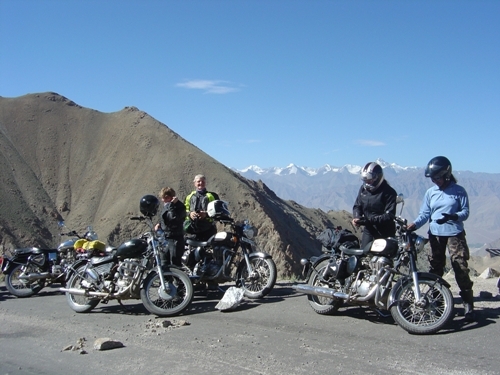 Kinnaur-Spiti is the 2nd most favorite route in India for the bikers. It is tough and challenging, beautiful and breathtaking, a spectacle which goes beyond your imagination. The itinerary is designed in such a way that you get ample time to get used to your bike, traffic behavior, roads and altitude. The entire tribal belt of Kinnaur and Spiti is bestowed with incredible landscaping which cannot be described or put into words. You have to be there to appreciate its amazing beauty. Type of tour: Moderate. Some of the off road bike experience is needed. Day 1. Delhi-Chandigarh Arrive Delhi. Transfer hotel Metropolitan or equivalent. The temperature in Delhi will be in 40s, you will be taking rest in your five star accommodation. Take evening Shatabadi for Chandigarh. Check into hotel Shiwalikview. Overnight hotel. Day 2. Chandigarh-Mandi(750m) (210km) After breakfast, start your first ride to Mandi. It is 5-6 hrs ride. It is national highway and road conditions are excellent. Nalagarh, Kiratpur Saheb and Bilaspur are the major towns on the way. Check into hotel valley view. Overnight hotel. Day 3. Mandi-Chindi. (1970m) (84km) After breakfast, start your ride to Chindi, 3-4 hrs ride. Chindi is a small town, lush green and dense forest. Overnight hotel. Day 4. Chindi-Sarahan (1990m). (85km) It is 5-6 hrs ride. From Chindi the road goes sharply down to Sainj and then to Rampur (800m) and you will see one of the biggest indian river ‘Satluj’ flowing along side the road. For Sarahan, you will ride up the road for 18 km. Overnight hotel Srikhand. Day 5. Sarahan-Sangla(2680m). After early breakfast, start your ride for Sangla valley which is full of lush green forests, cascading waterfalls and colorful small villages. River Baspa adds beauty to this beautiful valley. Overnight camping in Rakcham..
Day 6. Sangla-Kalpa(2960m). (51km) 3hrs ride. Today, if time permits, we will go to Chitkul(3460m) from Sangla (26km). In the afternoon, we start for Kalpa. Here we will be stopping at Recong Peo(2290m) for inner line permit. It is a big city and from here the road goes up (13km) towards Kalpa which is a very beautiful place, full of green and thick forests and high snow covered mountains. Overnight hotel. Day 7. Kalpa-Nako(2950m). (122km) 6-7 hrs ride. River Satluj continuously flows along the road and you cross deep gorges and dry high mountains. Since it is very close to the border with Tibet, you will see many army establishments. You will be reaching Nako in the afternoon. It is a beautiful, small village with a tiny natural lake in the middle of it. It looks splendid especially in the early morning, gives heavenly feeling. Overnight guest house. Day 8. Nako-Kaza(3600m). (121km app) 7-8 hrs ride. We will be enteringSpitiValley today and from the check point, Spiti river starts flowing. Enjoy lunch at Tabo(3050m) (69km). Visit Tabo monastery. Reach Kaza in the evening. The temperature will be low here. Overnight hotel The Spiti. Day 9. Kaza. Rest day in Kaza. Today you will be exploring the incredible landscaping of this amazing place, visiting Kibber village(4205m) (19km) and Kie monastery (12km). Evening free for personal activities. Overnight hotel. Day 10. Kaza-Sissu(3130m). (140km) 6-7 hrs ride. CrossKunzumPass (4551m), river Chandra starts from the bottom of this pass.You will see endless water falls on the way. Enjoy packed lunch with hot tea at Chhatru. A small place comes which is called Grumphu(17km), here the road joins with Leh highway. Ride from here towards Sissu 22km. Overnight camping. Day 11. Sissu-Manali (2050m). Start your ride after early breakfast crossing Rohtang Pass (3950m), 5-6 hrs ride. Manali is full of nature, rich in culture and very picturisique. It bustles with tourists coming from all over the world. It is famous for beautiful treks, hiking and climbing. One of the best mountaineering institutes is located here. RiverBeas flows in this city, adding incredible beauty to this place. Evening free for personal acitivities. Overnight Banon resorts. Day 12. Manali. Day free for personal activities. Day 13.Manali-Kiratpur Saheb. After lunch you will be travelling to Kiratpur Saheb (215km). Visit Roerich Art gallery on the way in Nagar.Take late night train for Delhi. Reach Delhi in the early morning. Day 14. Delhi. Check into hotel Metropolitan or equivalent. Day 15. Fly back to your destination. Please contact us for pricing and customized tour. Type of tour: Tough and a lot of off the road biking experience is needed. the world and rightly very popular with bikers. It attracts thousands of biking lovers from all around the world every year. shopping at the bustling Connaught Place. Overnight hotel. DAY 2. Delhi‐Agra‐Delhi (200km). After early breakfast, you will be taken in luxury bus or taxis to Agra, 4‐5 hrs journeys. Express’ from Delhi to Kiratpur Sahib. Reach there in the early morning. DAY 3. Kiratpur Sahib‐Manali. You will be travelling by air‐conditioned cab from Kiratpur Sahib to Manali (6 hours, 210km). You will be crossing Bilaspur, Sundernagar, Mandi and Kullu. Reach Manali in the afternoon. Check into Banon Resorts or equivalent. Evening free for rest. Overnight hotel. DAY 4. Manali (2006m). After breakfast, You will be given your bikes. Ride to Nagar (17km). Visit beautiful Castle and famous Roerich Art Gallary. Enjoy lunch at german bakery. Ride back in the afternoon. Evening free for personal activities.Overnight hotel. DAY 5. Manali‐Sissu(3120m). After early breakfast, start your ride towards Sissu (6‐7 hrs, 85km), crossing Rohtang Pass (3980m). 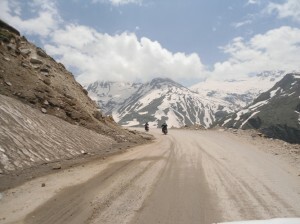 Rohtang Pass can be really tough during rainy season as one has to cross many kilometers of deep muddy road. Reach Sissu, a small village in the afternoon.Overnight guest house. DAY 6. Sissu‐Jispa(3142m). Start riding towards Jispa (53km,2‐3 hrs) after breakfast. Stop at Tandi (the only petrol station on this route before Leh) for refueling your bike. The other major town on the way is Keylong. Reach Jispa in the afternoon. Check into Ibex hotel. Overnight hotel. DAY 7. Jispa‐Sarchu(4253m). Start your ride again and reach Sarchu, 95km, crossing Baralachla pass (4830m). You will see river Bhaga flowing in this area, giving it a spectacular look. After Keylong, small towns Jispa and Darcha comes from here the major treks to Lamayuru and Padum(Ladakh) start. Even greenery ends at Darcha and desert mountains start. Overnight camping. DAY 8. Sarchu‐Leh(3505m). Today it is going to be a long ride, 222km from Sarchu to Leh , crossing three passes, Nakila Pass(4740m), Lachungla Pass (5019m) and Tanglang La pass the highest (5360m). You will witness incredible landscaping in this area and you would like to stop regularly to admire the creation of God. Natural beauty which you see here, can benever found anywhere in the world. The passes are tough but as we cross the last pass, we come down to Rumtse, first small town and from here the plains start. Upshi, which is 50km from Leh, is the another big town on the way and you will stop here for a cup of tea. From here river Indus flows along the road to Leh. Reach Leh in the evening. Overnight hotel Larimo or equivalent. DAY 9. Leh. Rest day for acclimatization. Half day local sight seeing covering Shanti Stupa, Leh Palace, Shey Monastery, Thiksey Monastery. Overnight hotel. security zone and anybody entering Nubra valley needs a permit. Enjoy camel safari at this spectacular place. Monastery and hot springs in Panamik. Overnight camping or guest house. 1/3 of its portion lies in Indian territory.Reach there in the evening. Overnight camping or guest house. DAY 13. 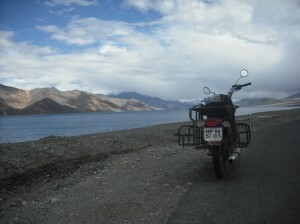 Pangong‐Leh. After early breakfast, start your ride to Leh, (145km,5‐6 hrs). Evening free for leisure activities. DAY 14. Leh‐Delhi. Take a morning flight to Delhi. Evening free for personal activities. Overnight hotel. DAY 15. Destination. Fly back to your destination. Please note that customized tour can be arranged for a group of four persons and above. Please contact us for customized tours and pricing. Type of tour: Easy, no off the road bike experience is required. Rajasthan, a princely state of India, is considered as the most colorful region, the exotic land of valiance and chivalry has an unusual diversity in all its forms-people, customs, culture, costumes, music, manners, dialects, and cuisine etc. It is the land of superlatives, everything here is reathtaking, beautiful, impressive and fascinating. It is endowed with amazing forts, magnificent palaces and havelies. The landscape is awe inspiring with lofty hills and shifting sand dunes. Aravalis, one of the oldest mountain ranges of the world run across the state. Day 1. Delhi. Arrive delhi check into hotel Godwin or equivalent. Overnight hotel. Day 2. Delhi-Agra (200km). After early breakfast, drive towards Agra. Since the traffic in Delhi is very busy, you will be starting early. The road is excellent and it takes 4-5 hrs to reach Agra. Check into hotel Park or equivalent. Visit Taj Mahal in the evening. Overnight hotel. Day 3. Agra-Jaipur (288km). After early breakfast, ride towards Jaipur via Fatehpur Sikri. Enjoy lunch on the way. Reach Jaipur in the afternoon. Check into heritage hotel Kanota Fort. Visit Hawa Mahal, Jal Mahal and City Palace. Overnight hotel. pilgrimage place and best known for Pushkar fair, which happens in the month of Oct. Overnight a heritage property. Day.5. Pushkar-Udaipur (274km). Today you will be going to Udaipur via Chittaurgarh which is famous for a big fort. Reach Udaipur in the early evening. It is called ‘City of Lakes’, perhaps one of the most romantic and beautiful cities of India. Overnight a heritage haveli. Day 6. Udaipur. Full day sight seeing covering city palace which is the largest palace complex of Rajasthan. Evening free for personal activities. Overnight hotel. Day 7. Udiapur-Luni (225km). It is 4-5 hrs ride. Today you will be staying at Fort Chanwa Luni which comes en-route to Jodhpur. The Fort is an exceptional example of elegance and symmetry in Indian architecture of the last century. The entire fortress is carved out of the famous red sandstone of Jodhpur. Enjoy local folk music in the evening. Overnight fort. industry. Check into a heritage hotel. 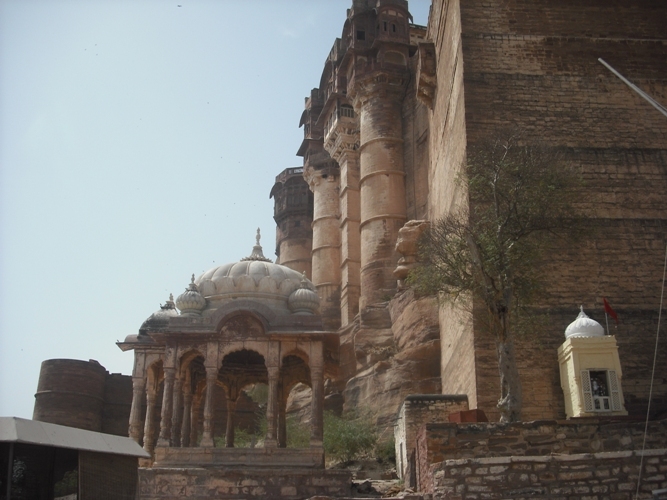 Visit Umed palace and Mehrangarh Fort. Overnight hotel. Day 9. Jodhpur-Manvar (110km). Today ride to Manvar, a desert resort and camp. You will be staying in desert camps today which are absolutely luxurious. Overnight camping. famous for sunrise and sunset. Overnight hotel. Day 11. Jaisalmer. Have a relaxed day today. Go for local sight seeing in the afternoon. Overnight hotel. Day 12. Jaisalmer-Bikaner (335km). Today it is going to be the longest ride, 6-7 hrs. The roads are excellent in Rajasthan. Reach Bikaner in the early evening. Founded in 1488 AD, Bikaner still preserves the aura of medieval times, harsh desert has left it untouched by outside influence. Check into Lalgarh Palace or equivalent which is a magnificent heritage property. Overnight hotel. Day 13. Bikaner-Mandawa (200km). Mandawa, the 18th century town, is famous for old havelis and forts and ancient architecture. It is a 3-4 hrs ride. Reach Mandawa in the afternoon. Evening fee for leisure. Overnight Desert Fort. Day 14. Mandawa-Delhi (285km) After early breakfast, ride to Delhi via Jhunjhunun and Gurgaon. Reach Delhi in the evening. Check into hotel Sunstar or equivalent. Overnight hotel. The itinerary is made for two weeks from Saturday to Saturday so that when you go back to your destination, you have Sunday to prepare yourself for the next week. Please contact us for customized tour and pricing. Type of tour: Easy, no off the road biking experience is required. Kerala: It is one of the most beautiful states sandwiched between the western Ghats on the east, and the Arabian sea on the west. It offers one of the best beaches in the country and one of the finest wildlife sanctuaries. Karnataka: It is situated on the western edge of the Deccan plateau with a 287km coastline opening out on the Arabian sea. One can find imprints of different dynasties in the magnificent stonework and the ruins of great cities founded on this plateau of luch tropical jungle, beautiful garden cities and ornate buildings. Tamilnadu: It is situated on the eastern coast at the southern tip of the indian peninsula. It has a coastline of about 1000km long. Its history, art, architecture and religion are reflected by its temple towns. Goa: A small tropical paradise, wedged between the Arabian sea and the Western Ghats, with its dazzling 105km, long palm fringed coastline create a seductive atmosphere which no tourist can resist. Day 1. 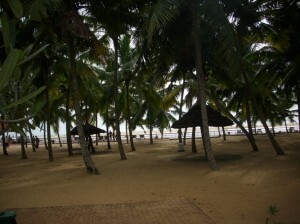 Kovalam beach (Trivendrum)(16km). Arrive Trivendrum, transfer Kovalam Beach which is full of golden sand with rich greenery of coconut palms. With a high promontory and a clam bay of blue waters, this beach paradise creates a unique aquarelle on moonlight nights. Relax the whole day. Overnight hotel Jasmine Palace or equivalent. Day 2. Poovar. (18km)You will get your bikes today. Ride to Poovar (18km). You will transfer to a beautiful 5 star hotel by a boat. The view is breathtaking. This resort is situated right on the estuary and you will have an incredible experience here. Overnight Estuary resort or equivalent. Day 5. Fort Kochi. (55km) This is one of the oldest city, a very charming place, with its waterfront and sidewalk cafes and old buildings. Check into a beach side hotel. Enjoy local sightseeing and state dance Kathakali in the evening. Overnight the Poovath heritzge hotel or equivalent. Day 6. Munnar. (140km) Ride to Munnar is very beautiful. You will see lush green tea gardens all around and the view is breathtaking. Overnight Sterling resort or equivalent. Day 7. Kodaikanal. (75km app) After breakfast start your ride to Kodaikanal, a beautiful hill station on Kerala and Tamilnadu border. It is situated on Nilgiri Hills. Overnight Sterling resort or equivalent. Day 8. Ooty. (200km app) Ride to Ooty, one of the oldest hill station in the south, is bikers delight. Reach Ooty in the evening. Overnight Club Mahindra Danish Villa or equivalent. Day 9.Masinagudi. (38km)This is a place with dense forest around and famous for wild life especially elephants. Here you find famous thirty six hair pin turns on the road. Check into a forest resort. Enjoy jeep safari in the evening. Overnight Club Mahindra resort or equivalent. Day 10. Mysore. (160km) Today you will be crossing famous Bandipur national park. Reach Mysore, a city of gardens, in the afternoon. Check into hotel Lalith Mahal Palace. Visit Mysore palace in the evening. Overnight hotel. Day 11. Coorg. (130km) Today, the ride will be very interesting with coffee plantation all around at many places. Reach Madikeri in the afternoon. Check into a beautiful resort. Here you can enjoy spa and ayurvedic massage. Overnight Club Mahindra resort or equivalent. city, Manglore on the way. Reach Udupi in the evening , a major pilgrimage centre, known for its mutts, many established by the 13th century saint Sri Madhavacharya. Check into the Turtle Bay beach resort or equivalent. Overnight resort. Day 13. Gokarna. (120km app) Gokarna, Half Moon, Paradise, Kudle and Om- some of these are perhaps the most beautiful beaches on this drive. Small and isolated by the ghats rising sharply around them. Overnight Om beach resort or equivalent. Day 14. 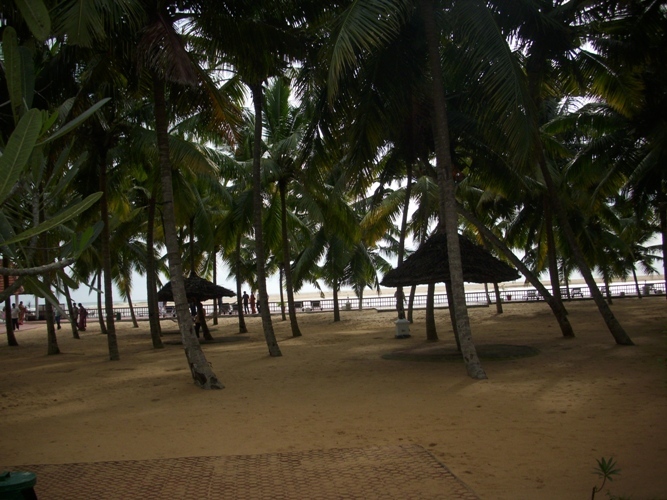 Goa Bogmalo beach . (130km) Start your ride after breakfast. Stop for lunch at beautiful Palolem beach. Reach Bogmalo in the evening. Check into a guest house. This beach is very beautiful with fewer crowds, clean and a lot of restaurants offering delicious sea food. Overnight guest house. Day 15. Departure. Fly to your destination. Please contact for customized tour and pricing. do you still offer women tours ? The dates all show 2013 ? Dear fellow biker – I would like to have some information about tours for women and tours in Himachal please. Information like dates, prices & itinery. I have looked at your website and I can’t tell whether it is up to date. I did a 6 day bike trip in Himachal in October this year: Amritsar, D’sala, Bir, Manali, Jalori Pass, Rishikesh, Delhi. On 500cc Enfield bullets. I had no problems with that. I am wondering whether that would be good enough for your tour, where you say off-roading experience is needed. Thank you in advance, I look forward to hearing from you. I have received your mail and i will be getting back to you asap. India Motor Biking tours Proudly powered by WordPress.